While Darkseid was only established as the adopted god of J'Onn J'Onzz's brother Ma'alefa'ak a decade back, Mayfair helped strengthen the bond between Darkseid and the Martian Manhunter begun through their both being released (and introduced to the general public) in the second series of the Super Powers Collection. That toy line and its tie-ins (including the Legends mini-series co-written by John Ostrander) mired the Martian Manhunter in the Fourth World for much of the late '80s. Mayfair hopped onto the bandwagon, commissioning the 1985 Grenadier Models Justice League of America & Adversaries Miniatures Set for use with their role-playing maps. Batman would naturally fight the Joker, Superman against Brainiac, leaving Hawkman, Green Lantern, Green Arrow, the Flash and Martian Manhunter all ganging up on Darkseid. Since most of those heroes had their own villains elsewhere, and J'Onn kept running into Darkseid throughput the '80s, there was some natural association to be made. It didn't hurt that their stats and origins were somewhat more compatible than humanoid guys wielding medieval weapons. 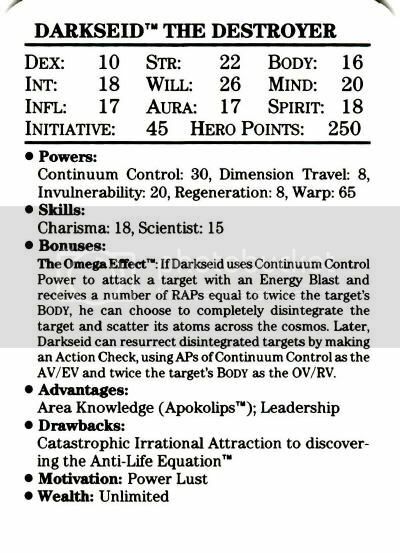 I'm not even going to try to break down Darkseid's obscene stats. Human heroes peak at an 8 in most respects, and metahumans are lucky to have abilities in the low teens. Your upper echelon might break 15 in something or other. 20s are reserved for gods and Superman. The Lord of Apokolips has a 30 and a 65. Get out of here! 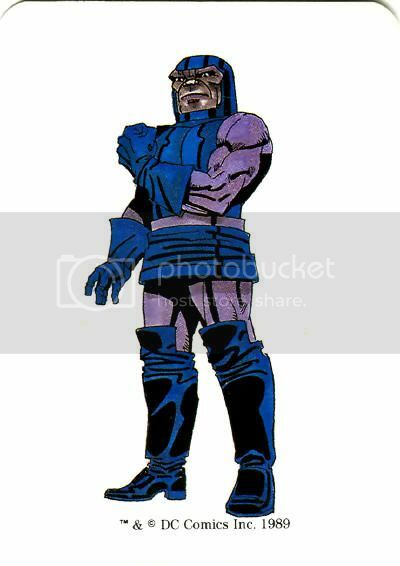 Heyyyyyy....how come Darkseid doesn't have a Wealth stat? He rules Apokolips for free? In Soviet Apokolips, Darkseid can spend all money, even soda pop machine coins with Granny Goodness on face. Don't you hate having to paraphrase yourself when you think a comment got eaten?